"I'll Be Over" plays really really well atSTRONG VG+ or better. It has several superficial surface marks that DNAP and cannot be felt with a fingernail. So, visually it grades lower at VG. "Toy Soldiers" visually grades STRONG VG- with one 1/4" light scratch and one 1/2" light scratch that cause light ticks. Play grade for this side is VG. 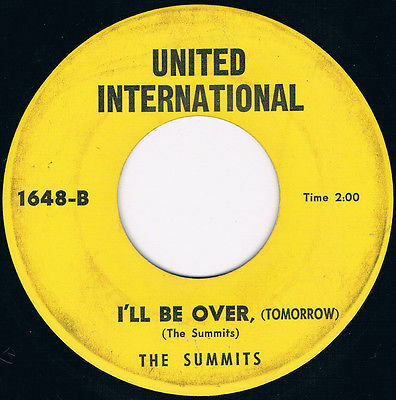 Notes:Monster Chicagogroup northern soul recordwith"I'llBe Over" intop play condition! I currently have a large offering of northern soul, funk, r&b,gospel, boogie & modern soul 45s up for auction. Please check the others out! USA: First Class is $3 +$0.50 for each additional record. Priority is $7 +$0.50 for each additional record. Overseas: First Class Package International is $13 +$0.75 for each additional record. Orders over $300 must be shipped Express Mail International. Express Mail International costs $46 + $0.50 for each additional record. Canada: First Class Package International is $9 +$0.50 for each additional record. Express Mail International costs $33 + $0.50 for each additional record. M-: Like new, should be no significant defects or flaws. Should play flawlessly. VG++: May have one or two superficial marks or smudges that do not effect play. VG+: May have some slight wear or loss of luster but no significant scratches or marks. Might play with very light surface noise or a very light crackle. VG: Will have wear or some dirtiness. Might have some light marks causing a few light pops or light crackle. Light to medium surface noise. VG-: Will likely have some light to medium scratches and significant wear causing medium surface noise and light to medium pops and crackle. G: May have heavy scratches, significant wear, or bad stains. Will play with heavy surface noise, heavy pops, or heavy crackle. POOR: Fundamentally flawed by skipping or big scratches or cracks.